War & Peace Volume 2 (The Peace Disc) is the sixth studio album by American rapper Ice Cube, released March 21, 2000 on his own label Lench Mob Records with distribution by Priority Records. It is the second part from the two-album project War & Peace; the previous volume, War & Peace Vol. 1 (The War Disc) was released in 1998. War & Peace Vol. 2 (The Peace Disc) peaked at number 3 on the Billboard 200 and at number 1 on the Billboard Top R&B/Hip-Hop Albums, selling 190,000 copies in its first week of release. The club song "You Can Do It", which then later re-released in 2004, was a UK #2 for Ice Cube. Despite the success of Ice Cube's film Next Friday, the album's promotion was unsuccessful, and other new artists such as Eminem, Xzibit and Dr. Dre's 2001 were on top of the charts. This was Ice Cube's final album under Priority Records and his last until the release of Laugh Now, Cry Later in 2006. The album has been certified Gold. "The What" by The Notorious B.I.G. ^ "War & Peace Vol. 2 (The Peace Disc) - EW.com". Entertainment Weekly's EW.com. ^ "Robert Christgau: CG: Ice Cube". ^ "Ice Cube :: War & Peace Vol. 2 :: Priority". ^ "Ice Cube". Archived from the original on 23 October 2007. 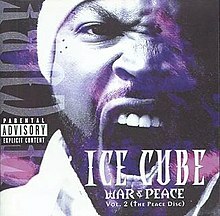 ^ "Music: War & Peace, Vol.2 (The Peace Disc) (CD) by Ice Cube". Tower.com. ^ "Chilled-out Ice gives 'Peace' a chance". ^ "Australiancharts.com – Ice Cube – War & Peace Vol. 2 (The Peace Disc)". Hung Medien. Retrieved January 3, 2014. ^ "Ice Cube Chart History (Canadian Albums)". Billboard. Retrieved January 3, 2014. ^ "Dutchcharts.nl – Ice Cube – War & Peace Vol. 2 (The Peace Disc)" (in Dutch). Hung Medien. Retrieved January 3, 2014. ^ "Official Albums Chart Top 100". Official Charts Company. Retrieved January 3, 2014. ^ "Ice Cube Chart History (Billboard 200)". Billboard. Retrieved January 3, 2014. ^ "Ice Cube Chart History (Top R&B/Hip-Hop Albums)". Billboard. Retrieved January 3, 2014. ^ "2000 Year-End Charts – Billboard 200 Albums". Billboard. Prometheus Global Media. Retrieved January 3, 2014. ^ "2000 Year-End Charts - R&B/Hip-Hop Albums". Billboard. Prometheus Global Media. Retrieved January 3, 2014. ^ "Canadian album certifications – Ice Cube – War & Peace Vol. 2". Music Canada. ^ "British album certifications – Ice Cube – War & Peace Vol. 2 (The Peace Disc)". British Phonographic Industry. Retrieved November 9, 2013. Select albums in the Format field. Select Silver in the Certification field. Type War & Peace Vol. 2 (The Peace Disc) in the "Search BPI Awards" field and then press Enter. ^ "American album certifications – Ice Cube – War & Peace Vol. 2 (The Peace Disc)". Recording Industry Association of America. If necessary, click Advanced, then click Format, then select Album, then click SEARCH. "Sic Them Youngins On 'Em"